After continuing to arouse much interest during its most recent public showing in Geneva earlier this month its full speed ahead for the innovative electric Bluecar which is the result of a joint venture set up last year between Pininfarina and Bolloré. Pininfarina and Bolloré set up a 50-50 joint venture at the beginning of 2008 with the purpose of designing, developing, manufacturing and distributing an electric car with revolutionary technical features and formal qualities. The Pininfarina Bluecar, on show at the Geneva Motor Show on the Véhicules Électriques Pininfarina-Bolloré stand, is therefore not a mere concept car but a forerunner of the vehicle which will go into production in Italy at Pininfarina starting from 2010 with the first units. Production on an industrial scale will take place between 2011 and 2017, with forecast output by 2015 being about 60,000. The Pininfarina-Bolloré electric car project, shown for the first time last October at the Paris Mondial de l’Automobile, has stirred up great interest from the sector as well as from the media and the public, proof that it is innovative and is moving in the right direction, well ahead of the times. 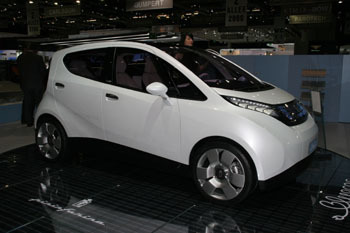 With awareness of the need to act to protect the environment going global, and with the use of cars being more and more concentrated in towns and limited to daily mileages of less than 60 km, the car market is undergoing a cultural revolution that opens new and promising scenarios for hybrid or totally electric vehicles like the Pininfarina Bluecar: recent studies have estimated that in the medium term 1.5-2 million electric vehicles will be introduced on the European market alone. In this context the Pininfarina Bluecar stands out from competitive proposals thanks to: its aesthetic excellence and the freshly original layout of a car born to be electric and not derived from a production car; and astonishing performance guaranteed by Bolloré technology. 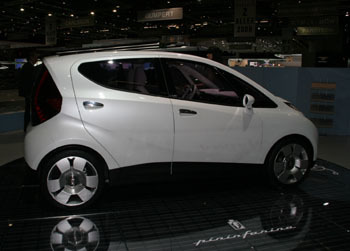 An elegant compact MPV with automatic transmission, conceived as a four-seater five-door, the Pininfarina Bluecar is supplied by LMP (Lithium Metal Polymer) batteries, combined with a device for energy storage (“super capacitor”), manufactured in the Bolloré plants at Quimper (France) and Montreal (Canada), which retrieves and stores energy during braking and makes it available when the vehicle re-starts. This means greater acceleration, an increased range and longer lifespan for the car’s battery. The LMP battery can be recharged at a traditional mains plug and range is 250 km. At equivalent weight, this battery stores five times more energy than a traditional type and recharges in just a few hours. As it does not require any maintenance, it has a life-span of about 200,000 km and provides unparalleled safety. The battery is housed below the floorpan and between the two axles. Due to its low centre of gravity, roadholding is outstanding. Moreover, the electric car produces no gas or fine particle emissions and no noise: LMP batteries thus make a real contribution to the fight against atmospheric pollution. The test drives carried out jointly by the Pininfarina and Bolloré teams have also confirmed the vehicle’s noteworthy driveability qualities. Pick-up is in line with that of internal combustion vehicles in the same segment (B/C). Safety-wise, the location of the battery beneath the floorpan responds to specific dynamic and passive safety criteria. The battery is protected from possible bumps. Part of the car’s hood is covered with high-performance solar panels which help power some of its equipment. Consistently with an ecologically responsible overall approach, all the materials employed for construction, the battery and interior trim have been carefully selected for their low environmental impact and are recyclable or reutilisable. The Bolloré group is also looking into the design of photovoltaic cell panels to be installed in private or public places to allow partial or total recharging of the batteries through solar energy alone. Innovative technology, sober, refined design and unmistakable brand identity place the Pininfarina Bluecar out of reach of the merely trendy. The Pininfarina genetic code emerges in the dynamism of volumes and the balance of proportions. The body of the car is shaped like an elastic shell resting forcefully on the four wheels, arching over its vertical axis and thrust forward by the shape of the sides. This idea of perfectly controlled physical strength is enhanced visually by the arched sills which contribute to the idea of the volumes thrusting forward. In the front view, the distinctive signs of Pininfarina design are seen in the iconic appearance of a vehicle that is strong and sure of itself without being aggressive. The design decisions are perfectly functional to the electric supply, hence the unobtrusive, short and sloping bonnet. 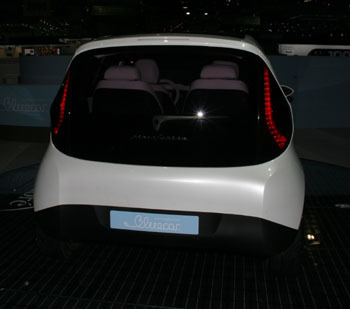 The car’s dynamic personality is underlined by the horizontal lighting clusters. At the base of the windscreen, an access hatch for recharging the batteries and for simplified routine maintenance. The wrap-round rear volume highlights the car’s agility and its liking for spurts of speed. The impression on climbing aboard is that you are in a vehicle that is much roomier than a normal city car: passenger comfort is guaranteed, as in a premium saloon, by four independent seats thanks to the absence of mechanical clutter due to the electric power unit. The interior trim stands out for the quality and precision of its detail and workmanship, a heritage of Pininfarina’s historic tradition. The upholstery, like all the furnishings, is in environmentally-friendly material. The central tunnel, which is both functional and decorative, and is moulded with refined lightness, has an original springboard form which strains forward towards the dashboard and hosts the window controls, the rearview mirror adjustment button and the original drive control which, of course, stands in for the traditional gear-lever. At the centre of the dash, the clear, readable upper screen provides all essential information: speed, range, state of battery charge. But the virtual heart of the information system is the great touch screen which brings together 90% of interaction possibilities between the vehicle and its user. Screen graphics are easy on the eye, intuitive and elegant. Just graze the screen to select the control function you require: climate control, audio system, GPS, call for assistance, phone, drive management mode (environment, sport or ice). Finally, a remote control incorporated in a portable phone allows you to monitor the state of the battery and trigger its pre-heating so that the vehicle is immediately ready to start, even after it has been parked a long time. The Pininfarina Bluecar that was on display at Geneva earlier this month can also fit a tyre concept developed by Pininfarina in cooperation with Dunlop. Extremely light, these tyres of new design can significantly reduce energy consumption while roadholding remains excellent.